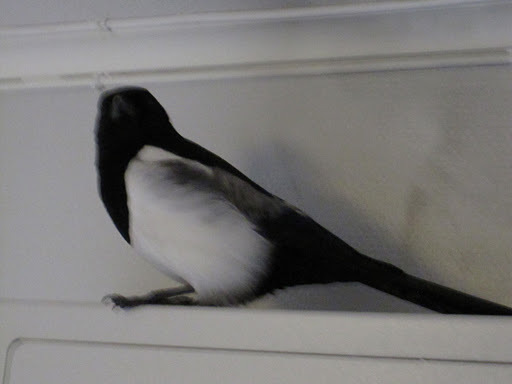 When I came home today, I found a magpie (Pica Pica) sitting on top of my outlet box. That’s on the fourth floor, so it had flown up the stairs. Confused bird. Anyway, I thought could just open the window and let it fly out, but it flew on up to the top floor where there’s no windows. So I got some gloves on, preparing to grab it and carry it down, and let it fly out the window on my floor. Whaddayouknow! Birds are difficult to grab. And magpies make really loud, startling sounds at a 20cm distance. Anyway, I kinda was able so shoo shoo it down to the open window, and it totally got the idea once it saw the window. It only bounced its head against the other window (which was closed) a couple of times. Anyway: Success! Fly birdie! Fly! This must have been at about the same time as we saw the most recent Big Bang Theory episode where Sheldon faces his ornithophobia. This cannot be a coincidence.